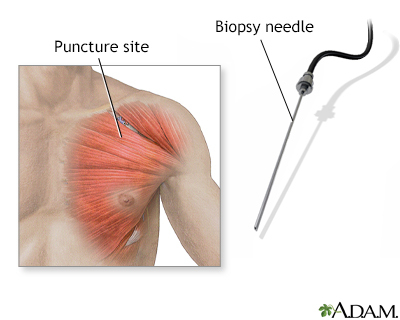 A muscle biopsy involves removal of a plug of tissue usually by a needle to be later used for examination. Sometimes more than one needle insertion may be needed to obtain a large enough specimen. If there is a patchy condition expected an open biopsy may be used. Open biopsy involves a small incision through the skin and into the muscle, so that a sample of muscle tissue can be removed from the affected area. There may be some slight bruising or bleeding at the site but the risks are minimal with the procedure.